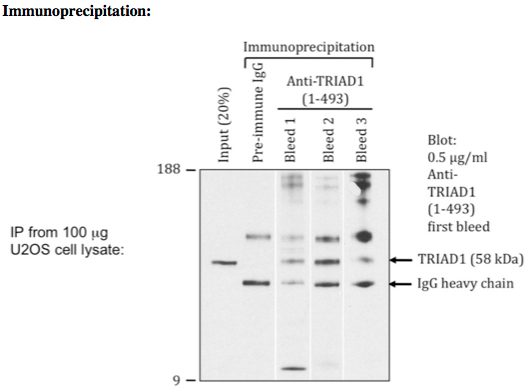 Affinity purified against recombinant protein GST- TRIAD1 (1 – 493) [DU 20431]. Detects single band of expected size (58 kDa). Can detect TRIAD1 is HEK293, U2OS and DT40 (chicken) cell lines. Can detect TRIAD1 is mouse kidney, heart, liver, brain, testis, muscle, spleen and ling tissues. 20 ug of antibody non-covalently coupled to Protein G-Sepharose successfully immunoprecipitated endogenous TRIAD1 from 100 ug of cell lysate. TRIAD1 and HHARI bind to and are activated by distinct neddylated Cullin-RING ligase complexes.